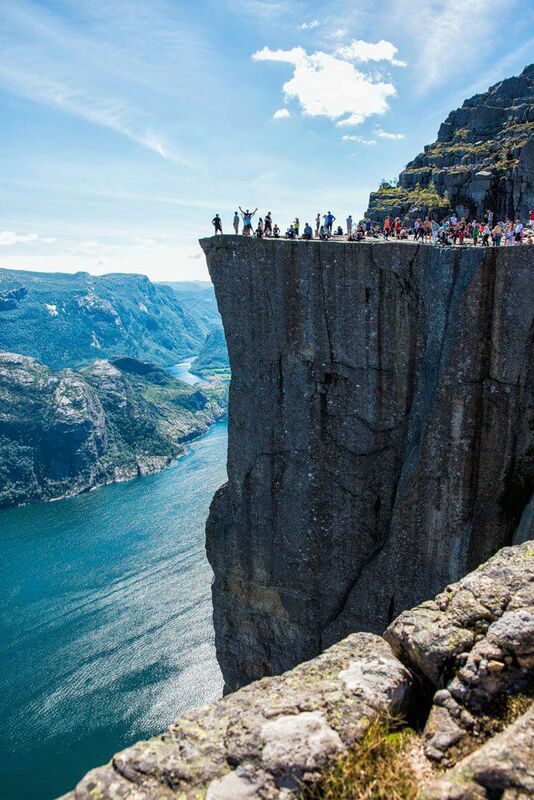 The hike to Pulpit Rock is one of the most popular hikes in Norway. 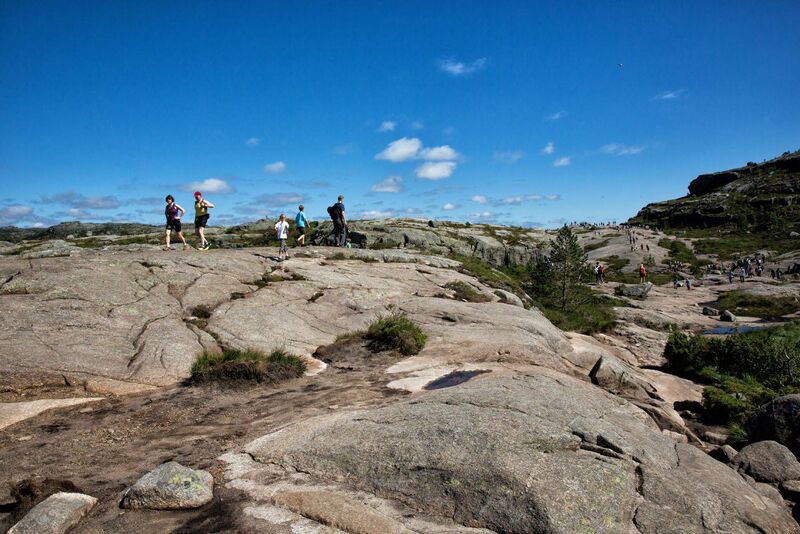 Its great views, relatively easy hiking trails, and convenient accessibility from the town of Stavanger is what makes this hike appealing to so many people. 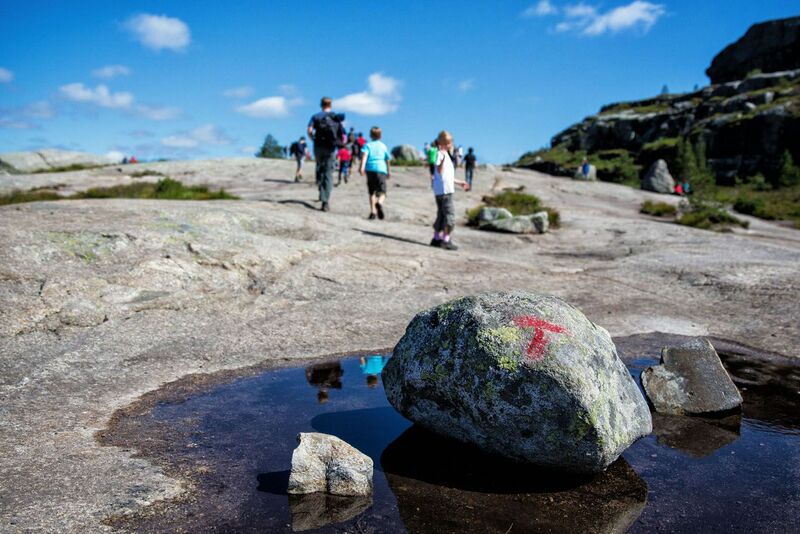 Stavanger and the hike to Pulpit Rock was our first stop on our tour of Norway. 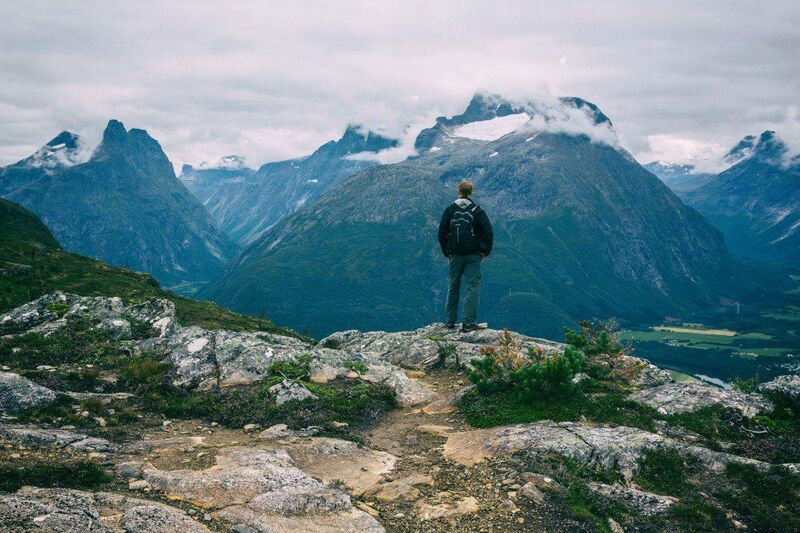 We instantly fell in love with Norway and it still remains one of our favorite spots in the world. 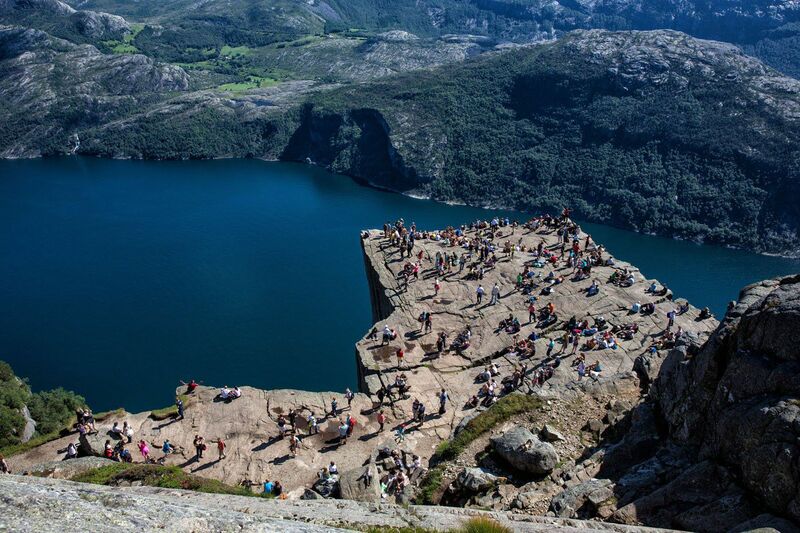 Pulpit Rock, also known as Preikestolen, is easily accessible from Stavanger. From the harbor of Stavanger we took a twenty minute car ferry to the town of Tau. We were not traveling by car but pedestrians are allowed to ride at reduced rate. Tickets are bought on board the ferry. It was a beautiful, cool, sunny morning and we were all excited for our first views of the Norwegian fjords. The ferry ride was beautiful and out in the distance we could see mountains rising up from the water. The cruise was incredibly windy and chilly, but Tim, Tyler, and I wanted to stay on deck and enjoy the views, while Kara was cold and miserable. Eventually, she went inside and sat by herself. In Tau, there is a bus stop located right at the exit from the ferry. Buses run several times a day from Tau to the car park at Pulpit Rock. The bus was not in Tau when we arrived, but we were lucky enough to share a taxi with several other hikers. About a half hour after disembarking the ferry we had arrived at the start of the hike to Pulpit Rock. The hike to Pulpit Rock is five miles round trip. 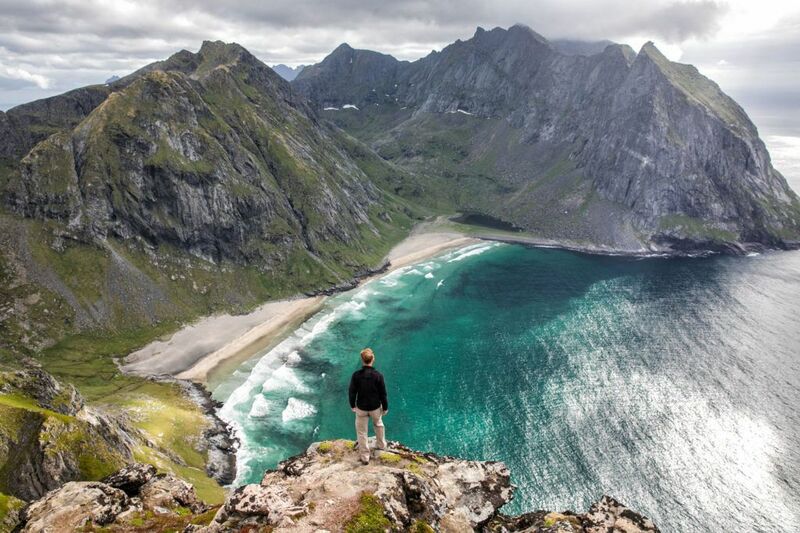 It is classified as an easy hike that people of all ages can do. 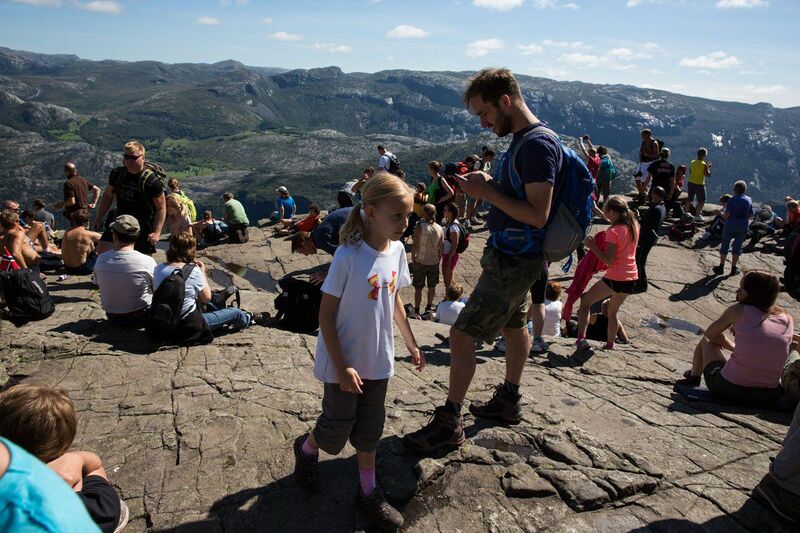 Guide books and the Visit Norway website recommends two hours to hike to Pulpit Rock, an hour to spend at Pulpit Rock, and a two hours to hike back. At noon we started our way up the mountain. It was very steep at first, and it didn’t take long until we were scrambling up boulders amidst pine forests. There were an incredible number of people on the trail. This definitely made the hike less enjoyable than we were expecting. We were constantly trying to pass people on narrow, rocky trails (as a family we hike at a pretty fast speed, including our eight year old daughter). It did not take us long until we were removing layers of clothing and working up a good sweat. The four of us took quick breaks on the way up, but not too long…we did not want to have to pass all of the same people again! It took us an hour and forty-five minutes to reach Pulpit Rock. Pulpit Rock was covered with people. August is peak season for vacationing in Norway and we were hiking on a perfect day just before the start of the weekend. The crowds were unavoidable. We made our way to the edge so we could hang our feet over the side. 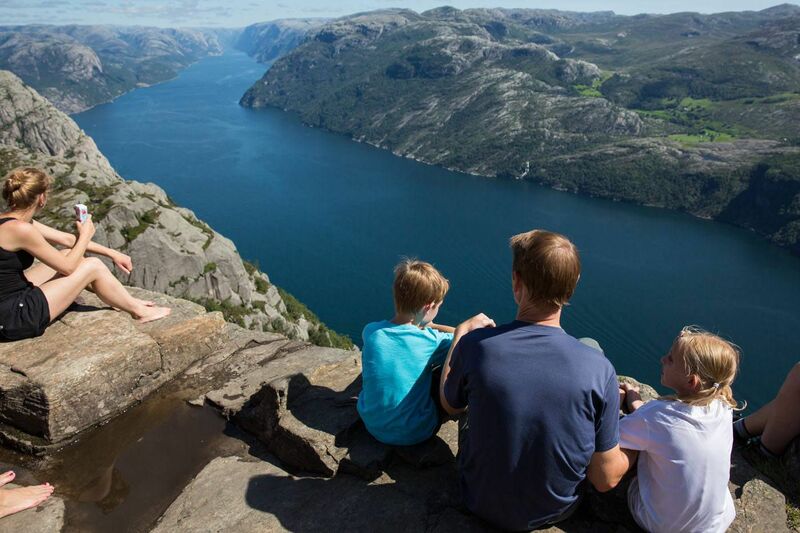 Tim and I always kept a close eye on Tyler and Kara; we did not want our kids making the dive into the fjord below. I left Tim, Tyler, and Kara on Pulpit Rock so I could get to a viewpoint to take their photo. Tim took the kids out to one corner of the rock. I wasn’t freaked out until I saw the three of them standing so near the edge of the rock. I took their photos and was relieved when we all met up again on more stable ground. We climbed a little farther uphill to be able to look down on Pulpit Rock. Wow, it was crowded! Now it was time to start the trek back downhill. Weaving between groups of people, hopping over rocks, crossing over wet, muddy areas, and climbing over thousands of boulders we made it to the starting point in just 45 minutes. Tyler and Kara are amazing. They are great hikers and are in fantastic shape. 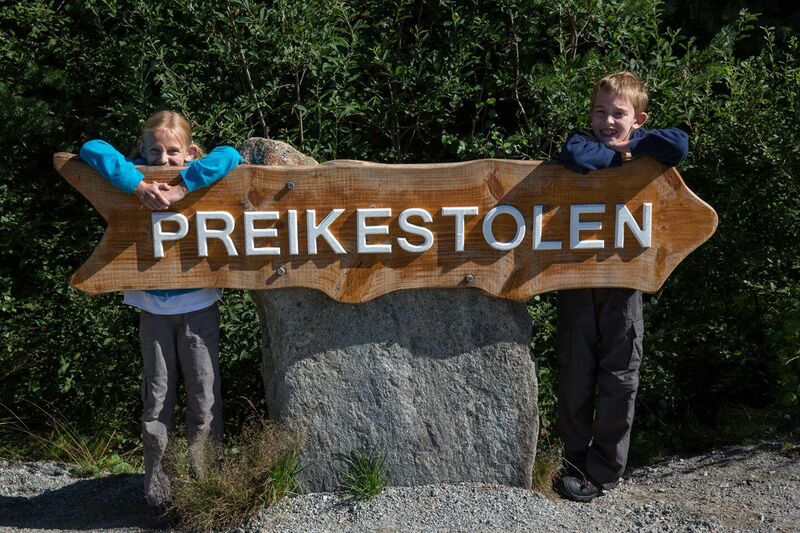 They should be fine for our next three hikes (Kjerag, Trolltunga, and Romsdalseggen). We caught a bus from the parking area at Pulpit Rock back to Tau, then took the car ferry to Stavanger, arriving at 5:45 pm. We wandered through the streets of Stavanger, had dinner, and then had a fantastic night’s sleep back at our hotel. The four of us had a good time hiking to Pulpit Rock. Climbing over the boulders was fun and the views from Pulpit Rock were amazing! Unfortunately, the hoards of people on the trails took away from the enjoyment of the hike. Still, we are glad we did it. 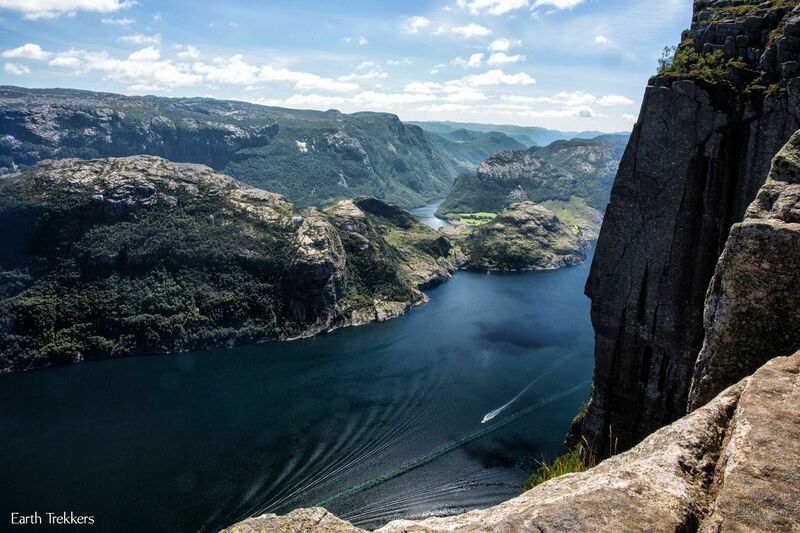 For someone looking for a relatively quick and easy hike with fabulous views of the Norwegian fjords, Pulpit Rock is perfect. 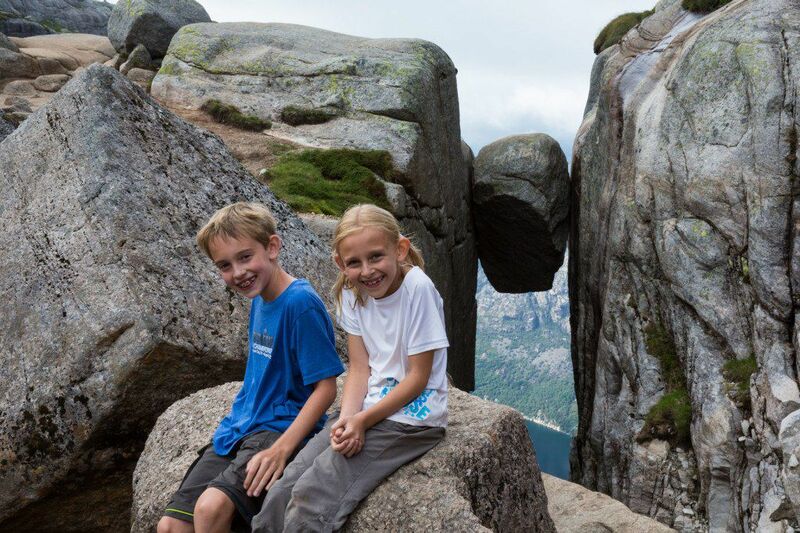 Tyler and Kara (who were 10 and 8 at the time) had a great time on the hike. Just put a boulder in their path and they have a good time. As far as their hiking experience prior to this trip, we had done some hiking at home in Maryland and in Shenandoah, Virginia, and also in Cappadocia, Turkey. 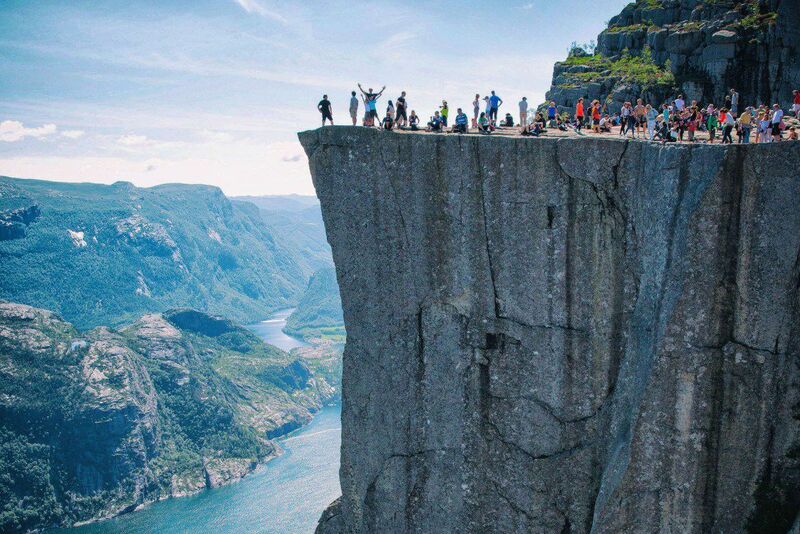 The hike to Pulpit Rock was easy for them, but they would be much more challenged in our upcoming hikes in Norway. 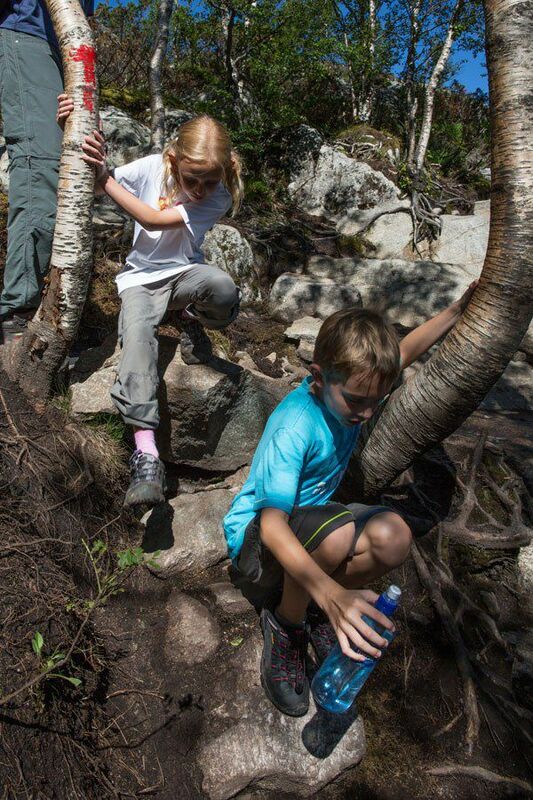 Children should be at least six years old to do this hike. 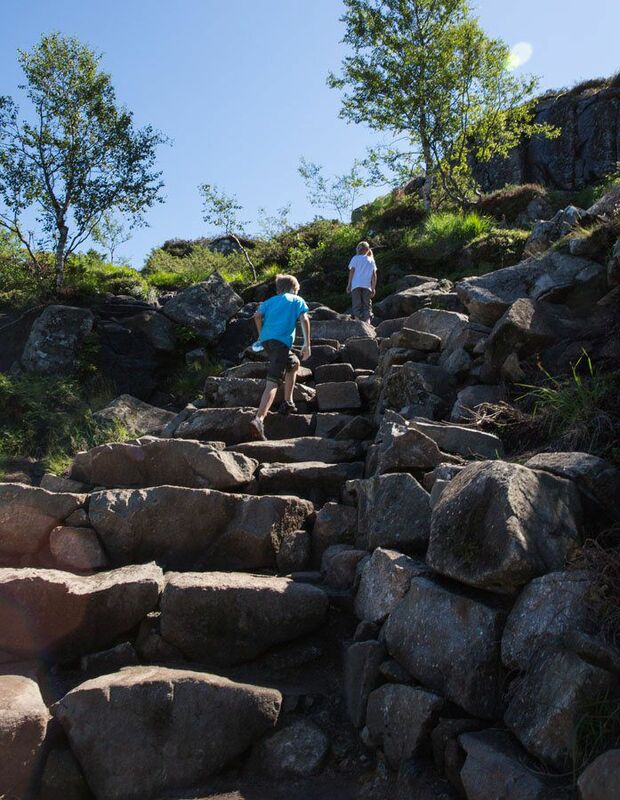 It is a somewhat strenuous uphill climb over rocks and boulders to get to Pulpit Rock. 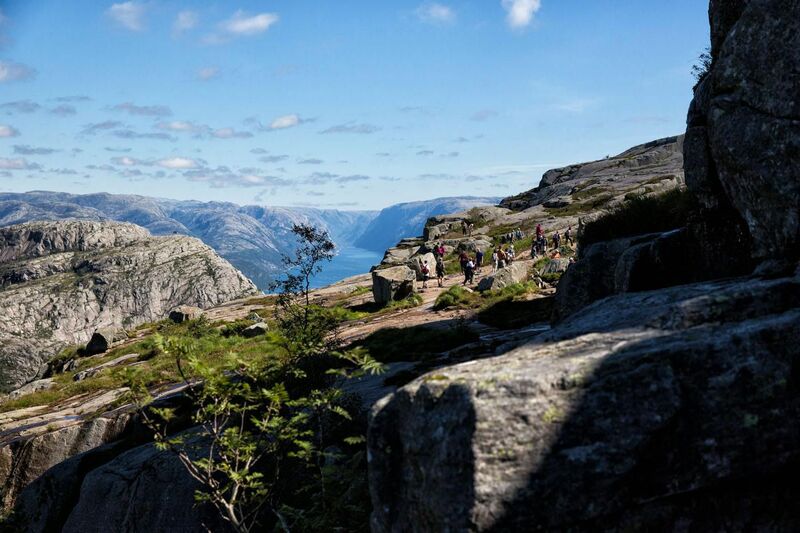 There is also a short section of the trail just prior to Pulpit Rock with a drop off down to Lysefjord. 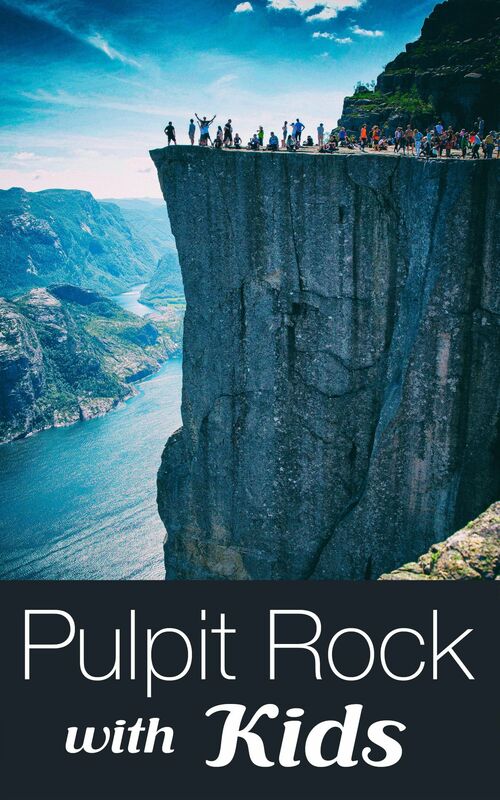 When Can You Hike to Pulpit Rock? The hiking season for Pulpit Rock is from April through October. Peak season is during the summer months of June through August. Expect large crowds during these months. To avoid the crowds, hike on weekdays and start the hike early in the morning. 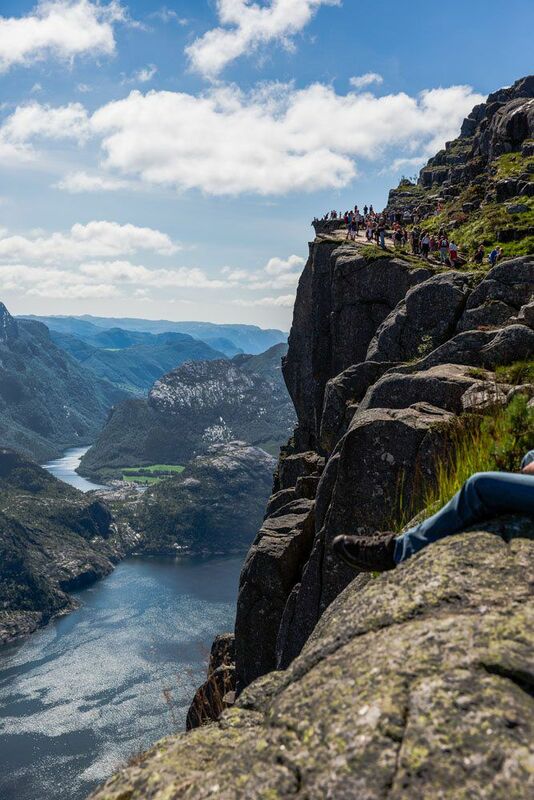 Public Transportation: Take the car ferry from Stavanger to Tau (40 minute journey) and then the bus from Tau to the Preikestolen car park. 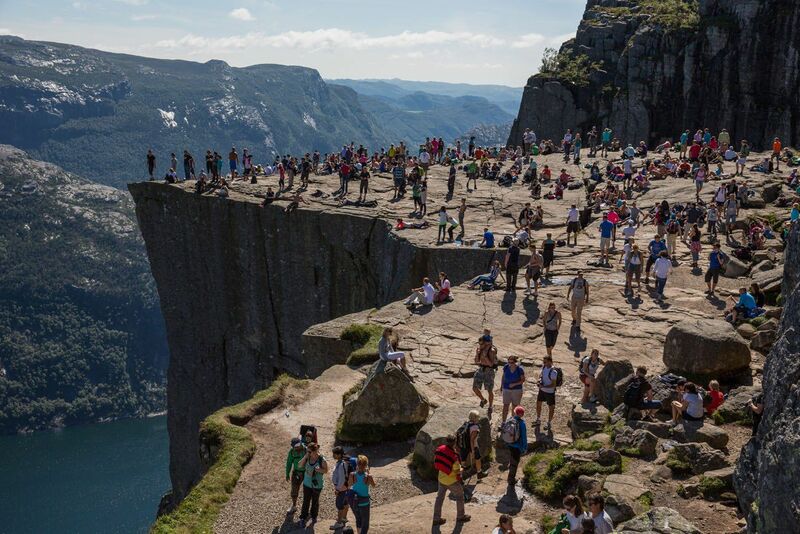 The bus to Preikestolen operates from April to September, according to the Visit Norway website. During off-season, the bus does not travel from Tau all of the way to the car park at the start of the hike. You will have to take a taxi instead. 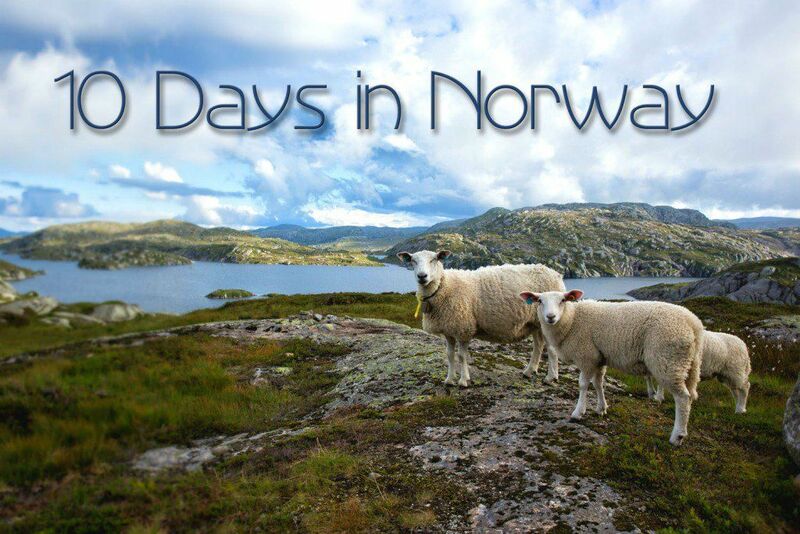 See the Visit Norway website for more details. 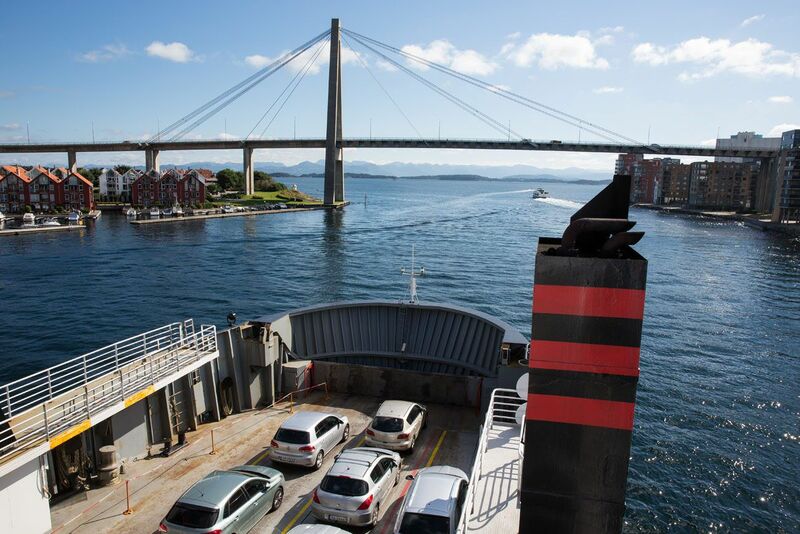 For the link to the Stavanger – Tau car ferry, visit the Norled website. If you have a car: You have two options. Take the car ferry from Stavanger to Tau and then drive on Route 13, Ryfylkevegen south through Jorpeland, following signs for Preikestolen. 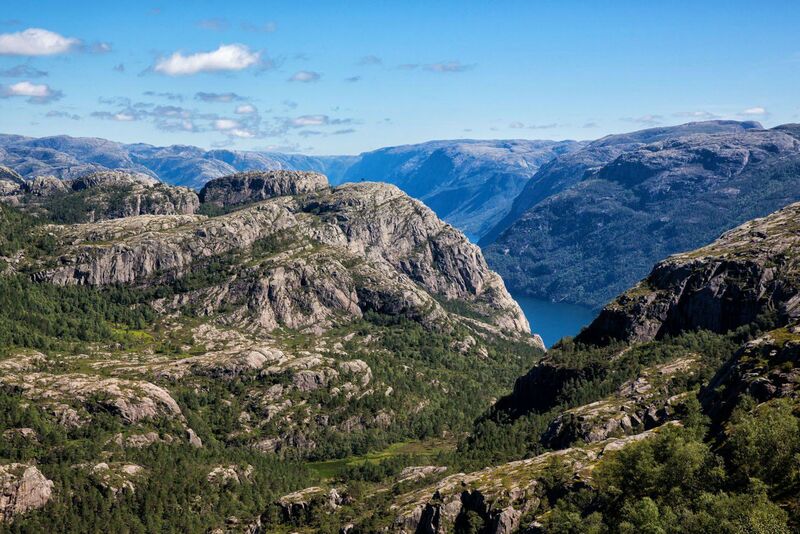 Your second option is to drive from Stavanger to Lauvvik, take the car ferry to Oanes, and then drive on Route 13 north to the Preikestolen car park. The Comfort Square Hotel. This modernly decorated hotel (with interesting artwork) is located within the heart of Stavanger. Take-away breakfast is available, perfect if you want to grab breakfast and get an early start hiking. Hi, we are both in our sixties and are fairly fit, how long do you think we would take to climb Pulpit Rock. It it a good time to do Norway in October, autumn and are the foliage colors changed? Beautiful pictures. 🙂 Just loved the blog. Can you please tell me if we start at the first ferry how much time do you expect us to complete the entire tour? We run (not very frequently) 3-4 km. if that helps to answer. Great post! 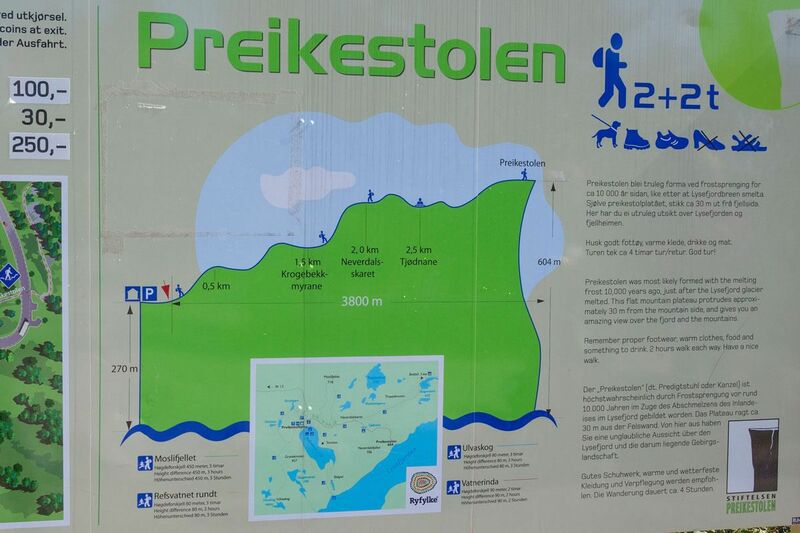 We will be there when I´m 30wks pregnant, I usually walk a lot and did many hiking before (not in the last year), do you think it´s safe to do it? Julie, really very informative blog. We are a group of around 25 people, all are in the age group of 60-70 years. We can walk 5-7km comfortably. But not much of hiking. 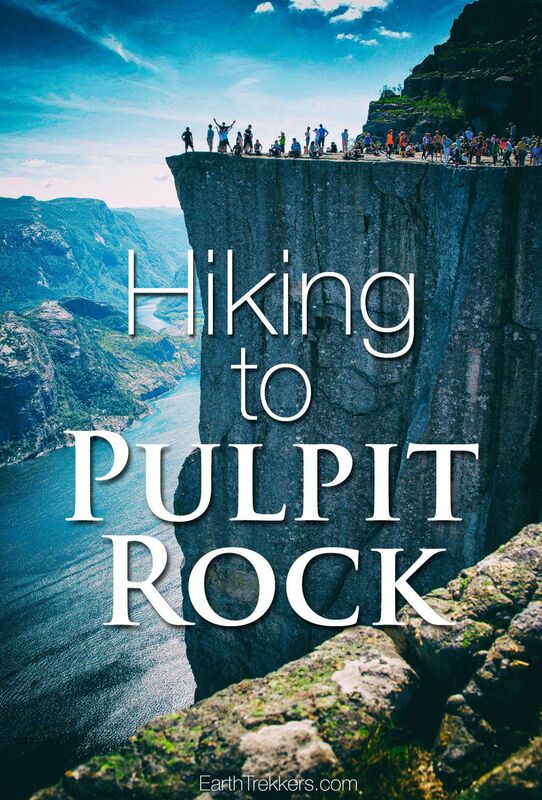 Do you think, we should plan this hike to Pulpit Rock? We are planning to go there in May 2018.